We were previously approached by Cindy Lawley (Illumina Market Development) for possible participation in an Illumina product development project, in which they wanted to have some geoduck tissue and DNA on-hand in case Illumina green-lighted the use of geoduck for testing out the new sequencing platform on non-model organisms. Well, guess what, Illumina has give the green light for sequencing our geoduck! However, they need at least 4μg of gDNA, so I’m isolating more. Isolated DNA from ctenidia tissue from the same Panopea generosa individual used for the BGI sequencing efforts. Tissue was collected by Brent & Steven on 20150811. Quantified the DNA using the Qubit dsDNA BR Kit (Invitrogen). Used 1μL of DNA sample. Yield is great (total = ~32μg). Evaluated gDNA quality (i.e. integrity) by running 162ng (1μL) of sample on 0.8% agarose, low-TAE gel stained with ethidium bromide. 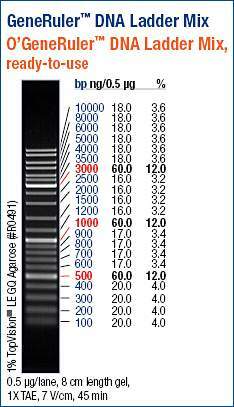 Used 5μL of O’GeneRuler DNA Ladder Mix (ThermoFisher). DNA looks good: bright high molecular weight band, minimal smearing, and minimal RNA carryover (seen as more intense “smear” at ~500bp). Will send off 10μg (they only requested 4μg) so that they have extra to work with in case they come across any issues. This entry was posted in Geoduck Genome Sequencing and tagged DNA Isolation, DNA Quantification, E.Z.N.A. Mollusc Kit, gDNA, gel, geoduck, Illumina, Panopea generosa, Qubit 3.0, Qubit dsDNA BR on 5 January, 2017 by kubu4. We were approached by Cindy Lawley (Illumina Market Development) yesterday to see if we’d be able to participate in some product development. We agreed and need some geoduck DNA to send them, in case she’s able to get our species greenlighted for use. Yield is low (~1.8μg), but have enough to satisfy the minimum of 1μg requested by Cindy Lawley. Evaluated gDNA quality (i.e. integrity) by running ~250ng (12.5μL) of sample on 0.8% agarose, low-TAE gel stained with ethidium bromide. Overall, the sample looks good. Strong, high molecular weight band is present with minimal smearing. However, there is a smear in the ~500bp range. This is most likely residual RNA. This is surprsing since the E.Z.N.A Mollusc Kit includes n RNase step. Regardless, having intact, high molecular weight DNA is the important part for this project. Will prepare to send remainder (~1.5μg) of geoduck to Illumina with other requested samples. This entry was posted in Geoduck Genome Sequencing and tagged DNA Isolation, E.Z.N.A. Mollusc Kit, gel, geoduck, O'geneRuler DNA Ladder Mix, Panopea generosa, Qubit 3.0, Qubit dsDNA BR on 21 December, 2016 by kubu4. In an attempt to improve upon the partial genome assembly we received from BGI, we will be sending DNA to the UW PacBio core facility for additional sequencing. 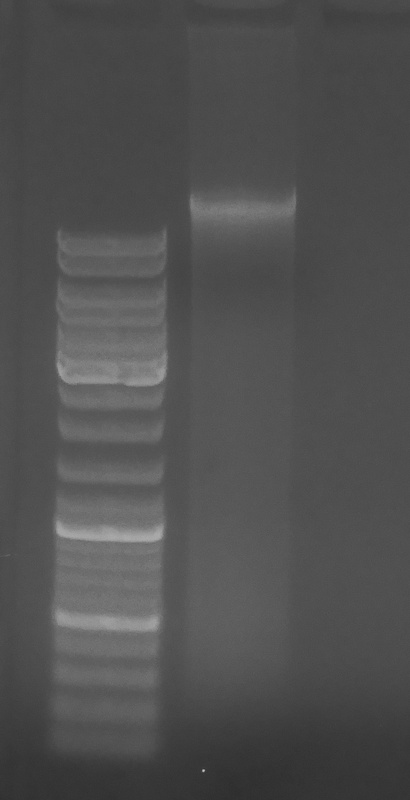 Isolated DNA from mantle tissue from the same Ostrea lurida individual used for the BGI sequencing efforts. Tissue was collected by Brent & Steven on 20150812. Yield is good and we have more than enough (~5μg is required for sequencing) to proceed with sequencing. Evaluated gDNA quality (i.e. integrity) by running ~500ng (1.5μL) of sample on 0.8% agarose, low-TAE gel stained with ethidium bromide. Overall, the gel looks OK. A fair amount of smearing, but a strong, high molecular weight band is present. The intensity of the smearing is likely due to the fact that the gel is overloaded for this particular well size. If I had used a broader comb and/or loaded less DNA, the band would be more defined and the smearing would be less prominent. Will submit sample to the UW PacBio facility tomorrow! This entry was posted in Olympia Oyster Genome Sequencing and tagged DNA Isolation, DNA Quantification, E.Z.N.A. Mollusc Kit, gDNA, gel, olympia oyster, Ostrea lurida, Qubit 3.0, Qubit dsDNA BR on 14 December, 2016 by kubu4. Ran 1μL of each sample from yesterday’s DNA isolation on a 0.8% agarose, low-TAE gel, stained with ethidium bromide. Since I didn’t load equal quantities of DNA, the intensities across the various samples is highly variable. Those samples with high degree of smearing are also those with the highest concentrations. Thus, one would expect to be able to visualize a greater range of DNA sizes in a gel (because more DNA is present). Notice the samples with nice, high molecular weight bands and little smearing (1NF16, 1NF17). These are less than half the concentrations of all the samples that exhibit extensive smearing (2NF3, 2NF8, 1NF12). So, I think all samples will be fine for proceeding with bisulfite conversion and subsequent library construction. This entry was posted in BS-seq Libraries for Genewiz, Olympia oyster reciprocal transplant and tagged 1NF11, 1NF12, 1NF13, 1NF14, 1NF15, 1NF16, 1NF17, 1NF18, 2NF1, 2NF2, 2NF3, 2NF4, 2NF5, 2NF6, 2NF7, 2NF8, gDNA, gel, O'geneRuler DNA Ladder Mix, olympia oyster, Ostrea lurida on 17 December, 2015 by kubu4. 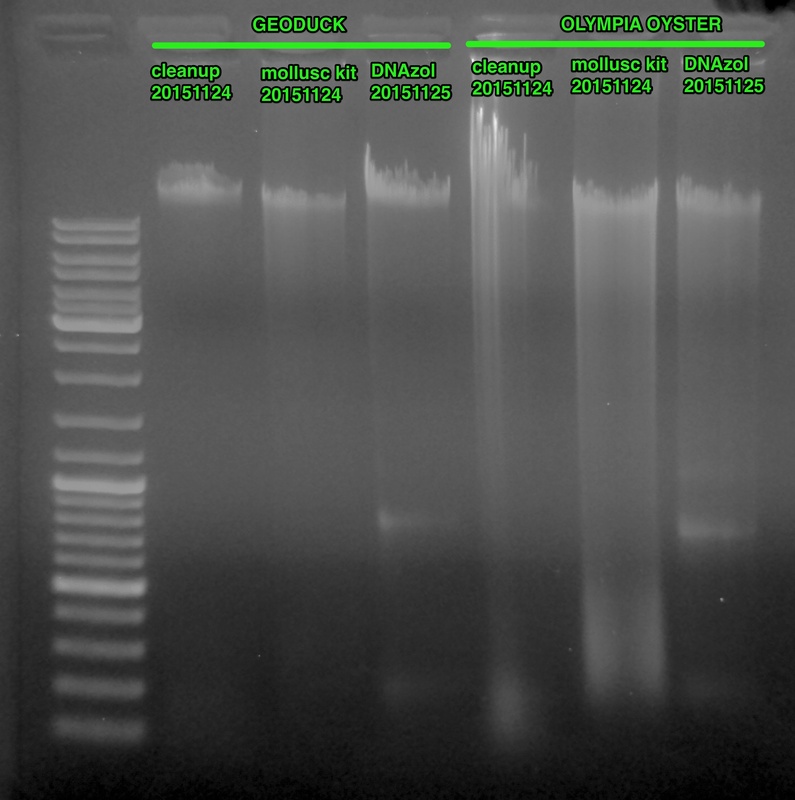 Ran 100ng of each sample on a 0.8% agarose 1x modified TAE gel w/EtBr. All the samples from both sets appear to be overloaded. Overloading is generally seen as the streaking seen immediately above each band. Overall, the samples look pretty good. Sadly, the worst of the three (due to the most smearing – i.e. degradation) appears to be the DNA extracted using the E.Z.N.A. Mollusc Kit (Omega BioTek). Also of note are the two bands present in the DNAzol sample. These bands are likely ribosomal RNA because I neglected to perform a RNase treatment during the extraction. Doh! None of them are particularly great. Just like the geoduck set, the worst of the three came from the E.Z.N.A Mollusc Kit (Omega BioTek). Also, just like the geoduck set, there are two bands present in the DNAzol sample. These bands are likely ribosomal RNA because I neglected to perform a RNase treatment during the extraction. Doh! The phenol-chloroform clean up sample is either jacked up or severely overloaded, based on the crazy streaking that’s present. However, this sample looked similar after the initial extraction on 20151113. I will send these samples separately (i.e. will not pool them into single samples) to BGI to run QC and, hopefully, add them to the DNA they already have to complete the genome sequencing for these two projects. This entry was posted in Geoduck Genome Sequencing, Olympia Oyster Genome Sequencing and tagged gDNA, gel, geoduck, O'geneRuler DNA Ladder Mix, olympia oyster, Ostrea lurida, Panopea generosa on 25 November, 2015 by kubu4.